Henry Wagons Wagons is roller coaster of an entertainer, Justin Townes Earle has described him as “Dr Seuss meets Conway Twitty”. 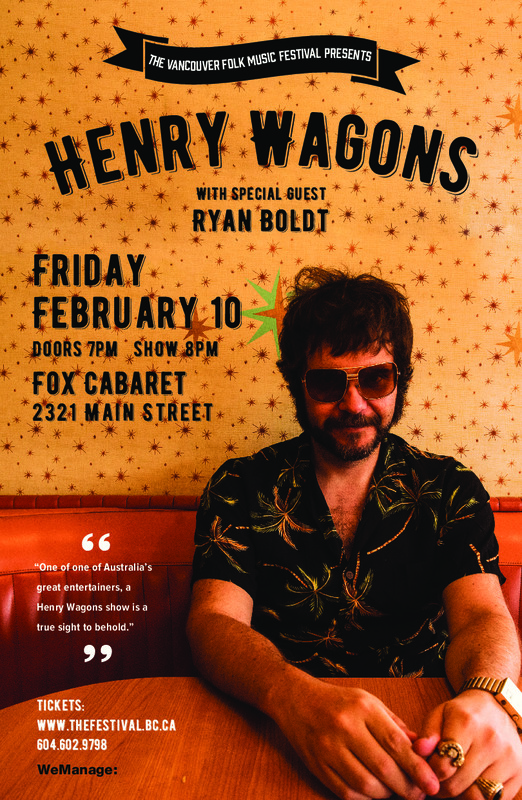 With a sound deeply rooted in the growling sounds of Johnny Cash and ZZ Top, Henry Wagons captures the rambling country-rock of the American South, despite not living in the country, or even the United States. Hailing from the sunny climes of Melbourne, Australia, Henry nails Americana with gritty, boastful tunes about bad choices, dark turns and too much drink. His sly sense of humour, charm and bluster are patient stowaways in his mesmerizing Trojan horse of a baritone. The leader of Australia's raucous country-rockers Wagons, Henry continues to explore the dark side of Americana as a solo artist. 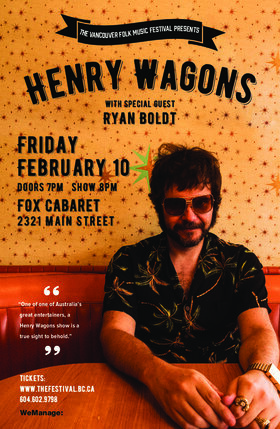 While his band released several critically acclaimed albums in Australia and made their U.S. debut with 2011's Rumble, Shake and Tumble, Henry Wagons started his solo career almost by accident. When the band completed its Rumble, Shake and Tumble tour, Henry fell ill upon returning to Melbourne. Instead of resting up, he wrote songs. After recording most of the music in his own studio, he recruited a who's who of guest vocalists -- including the Go-Betweens' Robert Forster and the Kills' Alison Mosshart -- to sing Lee Hazlewood-inspired duets with him. The results became 2013's mini-album Expecting Company? The live EP Upstairs at United 9 -- which was recorded at Nashville's United vinyl pressing plant -- also arrived that year. The Wagons band returned in 2014 with Acid Rain and Sugar Cane, a set of songs featuring the Bad Seeds' Mick Harvey as co-producer. For 2016's full-length solo debut After What I Did Last Night..., Henry Wagons traveled to Nashville to work with producer Skylar Wilson and some of the city's most respected Americana musicians. We look forward to Henry's return after making a huge splash at last year' Vancouver Folk Music Festival. Opening is Ryan Boldt, best known as the lead singer of Canadian prairie gothic folk band, The Deep Dark Woods.